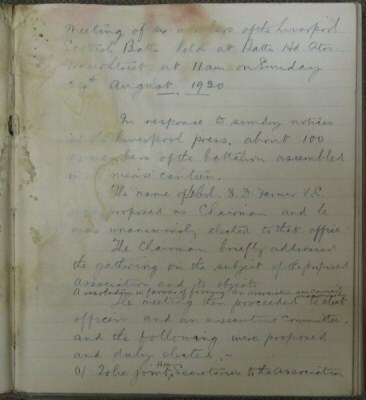 The Liverpool Scottish Regimental Association (LSRA) held its first meeting in the Men’s Canteen, at Battalion HQ., Fraser Street, Liverpool, on Sunday 24th August 1930. This was as a result of sundry notices in the Liverpool press enquiring about ex members of the LS Battalions. The name of Lt Col D D Farmer VC was proposed as chairman and unanimously elected to that office. The title approved, at this meeting, was ‘Liverpool Scottish Ex-Members Association’ with subs of 1 shilling (5p). At the next meeting the title changed to ‘The Liverpool Scottish Battalion Association’ before finally being changed to ‘Liverpool Scottish Regimental Association’ on 9th October 1930. The Forbes tartan tie was adopted as the Association tie. To foster ‘Esprit de Corps’. To render assistance to members of the Association. To collect and preserve records, trophies and other property of or connected to the Battalion. To assist and support the Battalion. The image is of the of the first page of the original minute book held in the Regimental museum archive. Today the Association's objectives are basically the same as originally except, that collection and preservation of records and artefacts has been taken over by the Liverpool Scottish Museum Trust. Membership is open to all serving and ex-serving members of any Army organisation incorporating the name ‘Liverpool Scottish’, including any ex Liverpool Scottish Cadets. The Association publishes a newsletter for its members, a back issue is included here as an example.